As per the Ministry of Finance OM No. 3379-E.III (B)/65 dated the 17th June, 1965, the resignation is treated as a technical formality where a Government servant has applied through proper channel for a post in the same or some other Department, and is on selection, required to resign the previous post for administrative reasons. The resignation will be treated as technical resignation if these conditions are met, even if the Government servant has not mentioned the word “Technical” while submitting his resignation. The benefit of past service, if otherwise admissible under rules, may be given in such cases. Resignation in other cases including where competent authority has not allowed the Government servant to forward the application through proper channel will not be treated as a technical resignation and benefit of past service will not be admissible. 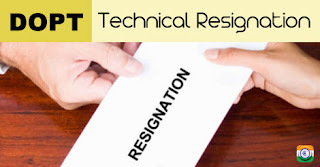 Also, no question of benefit of a resignation being treated as a technical resignation arises in case of it being from a post held on ad hoc basis. NOTE-I: Technical Resignation is a facility provided to the Central Government employees who are going to join other Central Govt jobs. State Govt employees, bank and any other PSU employees are not entitled to Technical Resignation to join Central Government. NOTE-II: An ordinary resignation from the service or post forfeits entire past service, but if the resignation is technical it does not result in forfeiture of past service. 1. The Government servant should intimate the details of such application immediately on their joining. 3. The authority accepting the resignation should satisfy itself that had the employee been in service on the date of application for the post mentioned by the employee, his application would have been forwarded through proper channel. CARRY FORWARD OF LEAVEIn terms of Rule 9(2) of the CCS (Leave) Rules, 1972, technical resignation shall not result in the lapse of leave to the credit of the Government servant. The balance of unutilized Child Care Leave (CCL) as well as all other leaves of the kind due & admissible will be carried forward. As per rule 39-D of the CCS (Leave) Rules,1972, in case of permanent absorption in PSUs/Autonomous Bodies/State Government etc., the Government servant shall be granted cash equivalent of leave salary in respect of EL & HPL at his credit subject to overall limit of 300 days. Carry forward of LTCEntitlement to LTC will be carried forward in case of a Central Government Servant who joins another post after having submitted Technical Resignation. Pay Protection, eligibility of past service for reckoning of the minimum period for grant of Annual IncrementIn cases of appointment of a Government servant to another post in Government on acceptance of technical resignation, the protection of pay is given in terms of the Ministry of Finance OM No. 3379-E.III (B)/65 dated the 17th June, 1965 read with proviso to FR 22-B. Thus, if the pay fixed in the new post is less than his pay in the post he holds substantively, he will draw the presumptive pay of the pay he holds substantively as define in FR-9(24). Past service rendered by such a Government servant is taken into account for reckoning of the minimum period for grant of annual increment in the new post/service/cadre in Government under the provisions of FR 26 read with Rule 10 of CCS (RP) Rules, 2016. In case the Government servant rejoins his earlier posts, he will be entitled to increments for the period of his absence from that post. GPF transferTransfer of GPF on technical resignation would be governed by Rule 35 of the General Provident Fund (Central Services) Rules, 1960. SeniorityOn technical resignation, seniority in the post held by the Government servant on substantive (permanent) basis continues to be protected. However, in case of a Government servant deciding to rejoin his substantive post, the period spent in another department which he had joined after submitting his technical resignation will not count for minimum qualifying service for promotion in the higher post. Applicability of Pension SchemeIn cases where Government servants, who had originally joined government service prior to 01.01.2004, apply for posts in the same or other Departments and on selection they are asked to tender technical resignation, the past services are counted towards pension if the new post is in a pensionable establishment terms of Rule 26(2) of CCS (Pension) Rules, 1972. They will thus continue to be cover under the CCS (Pension) Rules, 1972 even if they join the new post after 1.1.2004. New Pension SchemeIn case of ‘Technical Resignation’ of Government servant covered under National Pension System (NPS), the balance standing to their Personal Retirement Account (PRA) along-with their PRAN will be carried forward to the new office. Need for Medical examinationIn cases where a person has already been examined by a Medical Board in respect of his previous appointment and if standard of medical examination prescribed for the new post is the same, then he need not be required to undergo a fresh examination. Verification of Character & AntecedentsIn the case of a person who was originally employed in an office of the Central Government, if the period intervening between date of discharge from his previous office and the date of securing a new appointment, is less than a year, it would be sufficient if the appointing authority, before making the appointment, satisfies itself by a reference to the office in which the candidate was previously employed that (a) that office have verified his character and antecedents; and (b) his conduct while in the employ in that office did not render him unsuitable for employment under Government. If however, more than a year has lapsed after the discharge of the person from his previous office, verification should be carried out in full/afresh. NOTE-I: The benefit of past service, if otherwise admissible under the rules, will be allowed for purposes of fixation of pay in the new post. NOTE-II: Past service will be counted for age relaxation in Govt exams. NOTE-III: If the resignation from a post under a Central Government Department is technical, the tenure of service already completed by an employee is added to the time period spent while on service in the next post while determining the years of service for age relaxation provided for Central Govt employees. NOTE-IV: If you are going to same Grade Pay e.g. 4600 to 4600 or 2800 to 2800, you’ll be fixed on your existing basic pay or more as the case maybe, means you won’t be getting less salary than you were getting previously. This concept of protection is called PAY PROTECTION. NOTE-V: If it’s a technical resignation, as far as allotment of govt accommodation is concerned your seniority will be counted from the date of joining of your first service, whatever grade pay on you join in the new service. One should apply for the technical resignation as soon as one gets the OFFER OF APPOINTMENT for the new post; not before that. One needs to write just a simple application to the competent authority giving the reason for the same, the letter of OFFER OF APPOINTMENT being attached with. It represents the right of a Government employee to hold a regular post, whether permanent or temporary, either immediately or on the termination of the period of absence. NOTE: The above right will, however, be subject to the condition that the junior-most person in the cadre will be liable to be reverted to the lower post if at any time the number of persons so entitled is more than the posts available in that cadre/service. For example, if a person who is confirmed or whose probation in a higher post has been declared as having been completed or one who is holding a higher post for which there is no probation on a regular basis, reverts from deputation or foreign service and if there is no vacancy in that post to accommodate him, the junior-most person will be reverted. If, however, this officer himself is the junior-most, he will be reverted to the next lower post from which he was earlier promoted. NOTE: A Government servant on acquiring a lien on a post will cease to hold any lien previously acquired on any other post. i) If a permanent employee is selected on the basis of his application for posts in other Central Government Department/Offices/State Government, his lien may be retained in the parent department for a period of 2 years. If the employee concerned is not permanently absorbed within a period of 2 years from the date of his appointment in the new post; he should immediately on expiry of the period of 2 years either resign from the service or revert to his previous service. An undertaking to abide by this condition may be taken from him at the time of forwarding of his application to other departments/offices. ii) The exceptional cases may be when the Government servant is not confirmed in the department/office where he has joined within a period of 2 years. In such cases he may be permitted to retain the lien in the parent department/office for one more year. While granting such permission, a fresh undertaking similar to the one indicated above may be taken from the employee. iii) Timely action should be taken to ensure extension/reversion/resignation of the employees to their parent cadres on completion of the prescribed period of 2-3 years. In cases, where employees do not respond to instructions, suitable action should be initiated against them for violating the agreement/undertaking given by them as per (i) and (ii) above and for termination of their lien. Adequate opportunity may, however, be given to the officer prior to such consideration. iv) Temporary Government servants will be required to severe connections with the Government in case of their selection for outside posts. No lien will be retained in such cases. NOTE: In other words you can say that LIEN is facility given to a Central Government employee to go back to his previous Central Govt service if he goes in any other govt job giving Technical Resignation. To avail LIEN Employee should have completed his probation in previous department which is 2 years and also he should have been issued order for his confirmation in the previous department or 3 years of joining whichever is earlier. LIEN period is for 2 years, means a person has time of 2 years of time in his new department to go back to his previous department. His seniority in the parent department will not be affected in this whole process. He will join back in his previous seniority by taking LIEN. At the expiry of 2 years you will not get chance to go back your previous department.